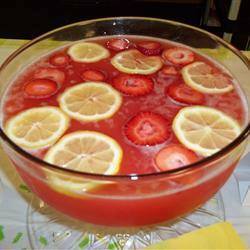 Bring the sugar, water, and strawberry flavored gelatin to a boil in a large saucepan; boil for 3 minutes. Stir in the pineapple juice, lemon juice, and orange juice. Divide mixture into 2 separate containers and freeze. Combine the contents of 1 container with 1 bottle of the lemon-lime flavored carbonated beverage in a punch bowl; stir until slushy. Repeat with remaining portions as needed. MEAT LOAF CUPCAKES WITH MASHED POTATOES!